The Kymin01600 719241work Historic SiteA charming 18th-century Round House and Naval Temple standing proudly atop a prominent hill, the Kymin and its nine acres of pleasure grounds overlooks Monmouth and the beautiful Wye Valley. Once part of the enormous Monmouthshire estate of the Duke of Beaufort, the Kymin’s fortunes have fluctuated over the last two centuries. 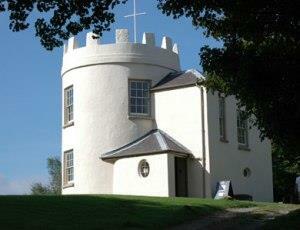 Originally a popular picnic site in the late 18th century, building on the Round House commenced in 1794. The Kymin is also home to the unusual Naval Temple. The Kymin Club arranged for the Naval Temple to be built with moneys raised between themselves and public subscription in 1800, it celebrates some of the greatest British admirals and victories of the time. A charming 18th-century Round House and Naval Temple standing proudly atop a prominent hill, the Kymin and its nine acres of pleasure grounds overlooks Monmouth and the beautiful Wye Valley. Today the Kymin is the perfect place to escape the hustle and bustle and enjoy a picnic against the stunning backdrop of the Wye Valley and the Brecon Beacons. Round House - see website for opening times. Car park open during daylight hours only. Adult: £3.00, Child: £1.50, Family: £6.75.